Thistles are especially troublesome following cool, wet summers and falls, when seed production and seedling establishment are high. An integrated weed control program that combines chemical, cultural (such as crop rotation or grass competition), mechanical and biological methods is most likely to be successful. Most thistles in the western United States are native species that generally go unnoticed and likely never will cause significant losses as weeds. However, thistle species introduced from Europe, Africa and Asia can be very aggressive opportunists. They often invade overused or otherwise disturbed land. The plants spread rapidly and outcompete established and introduced plant species for nutrients, and can render pastures, rangeland and forests nearly unusable. Biennial thistles, such as musk (Carduus nutans L.), plumeless (Carduus acanthoides L.) and bull thistle [Cirsium vulgare (Savi) Tenore], are not as difficult to control as the perennial thistle species, but spread rapidly and can become severe problems in some areas. All biennial thistles considered noxious are native to Europe or Eurasia, and were introduced into North America as seed contaminants. Biennial thistles spread only by seed (achenes) that are produced in great number by all the noxious species, ranging from 8,400 seeds per plant with plumeless thistle to 120,000 seeds per plant from musk thistle. Biennial thistle seed generally germinates in the summer and fall, and the plant overwinters as a rosette. The following spring, the plant resumes vegetative growth, bolts and flowers. Numerous, generally large flower heads are produced from May to October, depending on the species. After setting seed, the plants die, thereby completing the life cycle. Occasionally biennial thistles have winter annual, annual or short-lived perennial characteristics. Biennial thistles tend to invade overgrazed or otherwise disturbed pastures, rangeland, roadsides and waste areas. Movement into cropland generally is from nearby noncropland or roadsides. Since biennial thistles reproduce only from seed, the key to a successful management program is to control the plants before flowering. Plumeless thistle tends to be shorter than other noxious biennial thistles and generally reaches 1 to 4 feet tall. The stems are winged, very branched and very spiny, giving the plant a candelabrum appearance (Figure 1A). Figure 1A. Candelabra appearance of plumeless thistles showing spiny, winged stems. Rosettes have wavy leaves with yellow spines along the leaf margins. Rosette leaves often are pubescent on the underside along the midvein. The flowers usually are pink to purple, with thin bracts and very sharp spines (Figure1B). The plants flower from May to July in warmer climates, and as late as October in Canada. Seeds are dispersed one to three weeks after flowering. Figure 1B. Plumeless thistle flower with short, very sharp spines on the bracts. Plumeless thistle seldom is found in cultivated fields, even when infestations are nearby in roadsides or pastures. Plumeless thistle can germinate in and tolerate a soil pH range from 3 to 9. Vesicular arbuscular mycorrhiza has been found on plumeless thistle in Europe. These organisms live symbiotically with the thistle roots and can help the plant with water and nutrient absorption. Well-established stands of plumeless thistle are self-renewing because other species provide little competition, and old stalks catch snow to insulate the rosettes and increase soil moisture for the next season’s growth. Musk thistle is one of the more common biennial noxious thistles and is relatively easy to identify because it often grows in excess of 6 feet tall, has very large flowers that tend to droop, and the flower has very characteristic brown bracts that resemble pine cones (Figure 2A). The flowers usually are deep rose, solitary and very large, ranging from 1.5 to 3 inches in diameter. The average musk thistle plant produces in excess of 10,000 seeds per plant, and under favorable conditions may produce 120,000 seeds per plant. Seed germination generally averages 30 percent. Rosettes are dark green with a light green midrib and often grow 2 feet or more in diameter (Figure 2B). Rosette leaves usually are smooth and lacking pubescence. Musk thistle generally invades areas that are especially dry and overgrazed. Musk thistle seed is dispersed readily after introduction, so plants infest many acres in only one or two seasons. Infestations generally are more dense than with other biennial thistles, but less dense than perennial noxious thistles. Flowering is indeterminate, starting in early June and continuing for at least eight to 10 weeks. A late-blooming cycle often occurs just prior to frost. Seed from the late bloom primarily is responsible for the limited success of seed-feeding weevils (Rhinocyllus conicus) introduced for biological control of musk thistle. These insects attack the earlier blooms but have completed their life cycle before the last flowers set seed. Figure 2A. Musk thistle flower with large brown bracts and the tendency to nod or lean because of the large size of the flower. Figure 2B. Musk thistle rosette, which often grows 2 feet or more in diameter, with no pubescence on the underside of the leaf, which helps distinguish it from plumeless thistle rosettes. Bull thistle generally is the least serious of the noxious thistles. It occurs in all 48 contiguous states and most of Canada, but is designated noxious in only four states. The plant grows 2 to 6 feet tall. 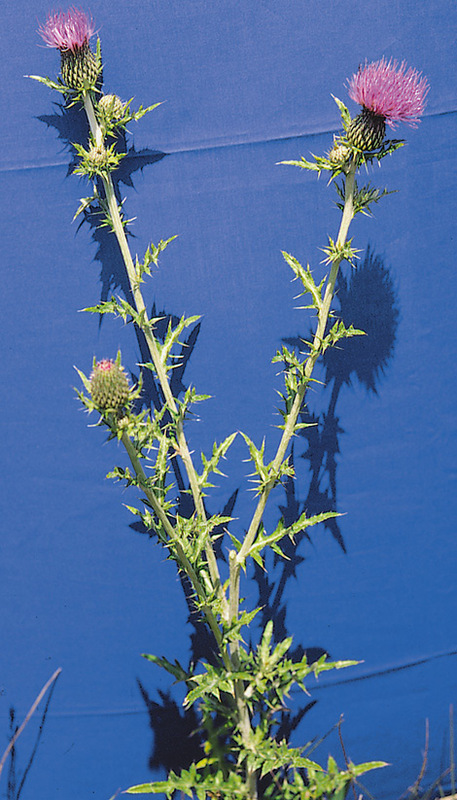 A distinguishing characteristic of bull thistle is the leaves (Figure 3A). Leaf margins are deeply toothed, and toothed again (double dentate) with prominent stiff spines. The leaves have prickly hairs above and are cottony below. The plant appears bushy rather than the candelabra appearance of plumeless or Canada thistle (Figure 3B). Figure 3A. Double dentate leaf with long, stiff spines at each tooth, prickly pubescence along the leaf midvein and winged stem, which is very pubescent during the rosette and early bolt growth stages of bull thistle. Figure 3B. Bushy appearance of bull thistle with spiny, conical shaped flower heads. The seeds germinate readily; however, seedling survival is low and bull thistle generally is found as single or scattered plants. The rosettes of bull thistle are very pubescent with dark purple ribs. The heads are gumdrop-shaped with long, stiff yellow-tipped spines. Bull thistle flowers from July to September, which is somewhat later then other thistles in the region. The flowers usually are purple, but a rare white flowering variety has been collected in the region. Perennial thistles, such as Canada [Cirsium arvense (L.) Scop. ], Flodman thistle [C. flodmanii (Rydb.) Arthur] and wavyleaf thistle [C. undulatum (Nutt.) Spreng. ], generally are more difficult to control than the biennial thistles because they spread by both root and seed. Top-growth control is not enough; one must design a program to deplete the root system for effective control of a perennial thistle. Both wavyleaf and Flodman thistle are native species that generally are only a problem when the land has been overused. Canada thistle was introduced from Europe, and like many introduced weeds, has spread rapidly because of the lack of natural enemies. All perennial noxious thistles are aggressive invaders and can become the dominant species in an area within a few seasons of introduction if not properly controlled. 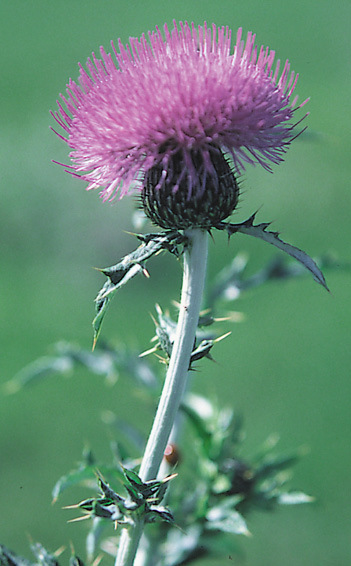 Canada thistle was introduced in North America as a seed contaminant in both French and British colonies. The first legislation to control the weed was passed by Vermont in 1795. 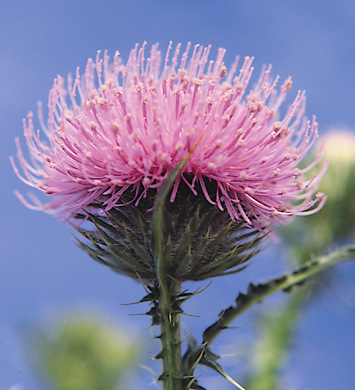 The native distribution of Canada thistle includes Europe, North Africa and central Asia. It also is found in China and Japan, and has spread so extensively that distinguishing the plant’s original native range is difficult. 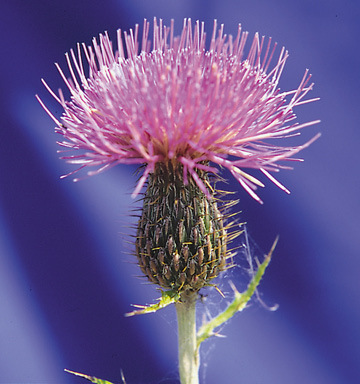 Canada thistle grows best in the northern U.S. and southern Canada, where temperature and rainfall are moderate. Canada thistle is adapted to a wide range of soils, but it produces deeper roots in clay or muck soils than in sand, gravel or limestone soils. Canada thistle requires a 14- to 16-hour photoperiod to bolt and flower, and growth ceases when temperatures exceed 85 degrees for extended periods. Canada thistle is considered to be naturalized in the northern Great Plains. Canada thistle usually grows 2 to 3 feet tall and bears alternate, dark green leaves that vary in size (Figure 4A). The leaves are oblong, usually deeply cut, and have spiny, toothed edges. Canada thistle has small (3/4-inch diameter), compact flower heads that appear on the upper stems and range in color from lavender to pink or white. Figure 4A. Bolted Canada thistle with cluster flowers and waxy, wavy leaves. Canada thistle has been classified into several varieties. Within these varieties are many ecotypes that differ in growth characteristics, response to day length, and susceptibility to herbicides and cultivation. For example, leaf shape, head structure, and the number and size of spines can differ with ecotype. Stem color also can differ from green to lavender. Some ecotypes show variable response to herbicides and/or cultivation. Flowering occurs from June to September. Male and female flowers are produced on different plants, so cross-pollination is necessary for seed production. Flowers produce from 40 to 80 seeds per head. The smooth, light brown seeds have a conical point and are loosely attached to a tannish pappus at the tip, which aids in seed dispersed by wind. Seeds mature rapidly and are able to germinate within eight to 10 days after pollination. Canada thistle overwinters in the rosette growth stage (Figure 4B). Figure 4B. Canada thistle rosette form with spiny tips and wavy leaves. 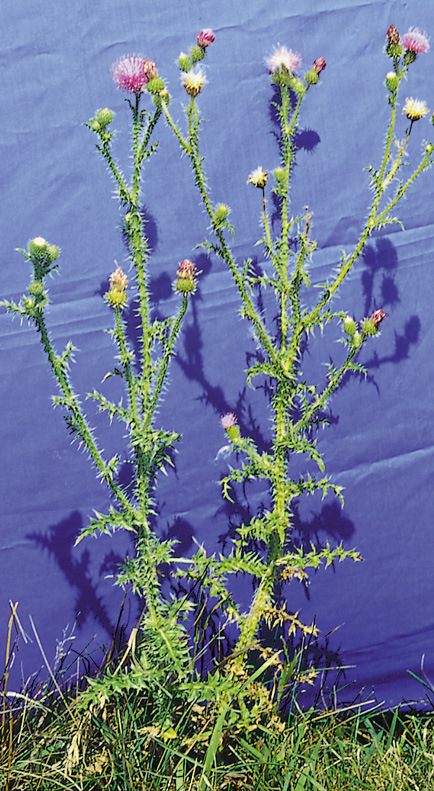 Canada thistle generally spreads from field to field in contaminated crop seed or forage. Within a Canada thistle population, some seed remains in the flower head or falls at the base of the plant. The wind can disperse the remaining seed, either attached to the cottony pappus in late summer or later in the winter, when wind-driven snow moves it across fields. Once the plant becomes established, roots are the most important means of propagation. Canada thistle has an extensive underground root system that may penetrate the soil to a depth of 10 feet or more and grow laterally 12 to 15 feet per year. Root buds occur randomly along the roots and initiate new shoots whenever environmental conditions are favorable. Root segments as small as 0.6 inch can initiate shoot growth and become established. 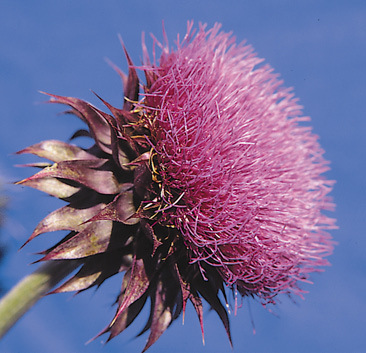 Flodman thistle is a deep-rooted perennial that is native to North America and usually grows 3 to 4 feet tall (Figure 5A). It occurs from Saskatchewan and Manitoba to Iowa and Colorado. Flodman thistle is more competitive than most other native species and has the potential to infest large areas. 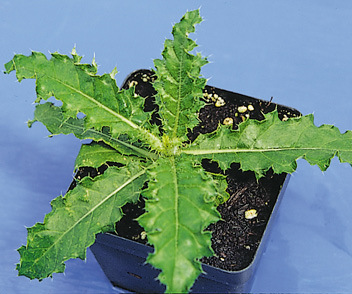 It is tolerant to high salt concentration in soil but not as tolerant as Canada thistle. As with most thistle species, Flodman thistle grows best under moist conditions but it can survive under drought conditions, which gives it a competitive advantage on semiarid rangeland. Figure 5A. Flodman thistle flowering plant showing deeply toothed leaves. The leaves of Flodman thistle are shiny green on top, white and pubescent below, rigid and deeply lobed. The lobes stick out at nearly right angles (flipping). A sticky secretion often is found on the small, oval-shaped heads, which attracts and catches insects (Figure 5B). Flodman thistle usually flowers from mid-July through September in North Dakota. The flower color ranges from red to violet and very rarely white. Figure 5B. Flodman thistle flower has a sticky secretion on the oval-shaped heads, which often attracts and catches insects. Wavyleaf thistle is a perennial native plant that often is confused with Flodman thistle. Wavyleaf thistle tends to flower from July to September, which is a week or two earlier than Flodman thistle. Wavyleaf thistle tends to be more spiny and the leaves less deeply lobed than Flodman thistle (Figure 6A). Also, wavyleaf thistle is found in well-drained soils, generally in drier locations than Flodman thistle occupies. Wavyleaf thistle grows 3 to 4 feet tall and often is associated with sagebrush communities and rangeland, but is less common in moist meadows. Figure 6A. Wavyleaf thistle is very pubescent and often gray, with leaves less divided than Flodman thistle. Wavyleaf thistle sometimes is called gray thistle because it has a white cast (Figure 6B). The leaves are very pubescent, with long, wavy hairs on both upper and lower surfaces. The large, globe-shaped heads contain glands that are tipped with strong, yellow spines. The flowers are most often pink or purple, but wavyleaf thistle has a white-flowered form, f. album Farwell, which most often is found in Saskatchewan. Figure 6B. Wavyleaf thistle flowers vary in color from lavender to pink, and stems are often white and very pubescent. Prevention is the best control method for both perennial and biennial thistles. Thistles often invade overused or disturbed land, such as cultivated fields. Plant weed-free seed to help prevent introduction into cropland, and keep field borders thistle-free. The best preventive measure in noncropland is to maintain a thick plant cover and reseed disturbed areas with a desirable species as soon as possible. Proper grazing management and rotational grazing practices should be established and maintained to prevent thistle establishment in grazing land. Controlled and rotational grazing can prevent thistle establishment because overgrazing weakens desirable species, making the pasture more susceptible to invasion. Pastures protected from overgrazing have little thistle establishment. An adequate fertility program ensures a healthy and vigorous pasture with species competitive to thistle. Avoid spreading thistle seed to uninfested areas with manure, mowers or other farm equipment. Establishing competitive grasses can reduce the size of rosettes and decrease thistle height, root weight and crown size. Once thistle invades an area, several control options are available, depending on the location and land use. Control options include cultural, mechanical, chemical, and biological methods. Combining two or more control options in an integrated management program generally is better than relying on a single control method. Repeated mowing will reduce thistle infestations, especially if the plants are biennial. Mow whenever the plants are in the early bud growth stage to prevent seed-set. Several mowings a year are needed because plant populations vary in maturity. Mow as close to the surface as possible. If plants are cut above the terminal bud before the stems elongate, they likely will regrow. Mowing before the flowers start showing color is important because plants mowed after that likely will produce some viable seed. Mowing for several years will reduce the root vitality of the perennial species and will prevent seed production, reducing the seed reserve. Mowing should be combined with a chemical control program for best results. Tillage is an effective method for perennial thistle control and will control biennial species completely. Rotations out of forage crops to annual crops will eliminate biennial thistle. Cultivate fields before the perennial species are 3 inches tall and repeat before regrowth reaches 3 inches tall until freeze-up. Cultivation depletes the energy reserves of the root system and eventually will control an established stand. Persistence and proper timing are important for control. Fallowing and repeated cultivation for one or more seasons prevents crop production and may expose fields to serious soil erosion. Integrating cultural, mechanical and chemical control practices into a single system is the preferred approach for perennial thistle control. Fire often is used for management of plant communities in North America, including management of invasive weeds such as Canada thistle (Figure 7A). Canada thistle response to fire has been erratic, with infestations sometimes reduced or occasionally enhanced by fire. However, ground litter is reduced, which results in uniform thistle regrowth and improved coverage with herbicides (Figure 7B). Herbicides applied to Canada thistle following a burn generally provide better long-term control, compared to treatments applied in very dense stands. Also, prescribed burns may stimulate growth of native species and discourage growth of invasive species, such as Canada thistle. Figure 7A. 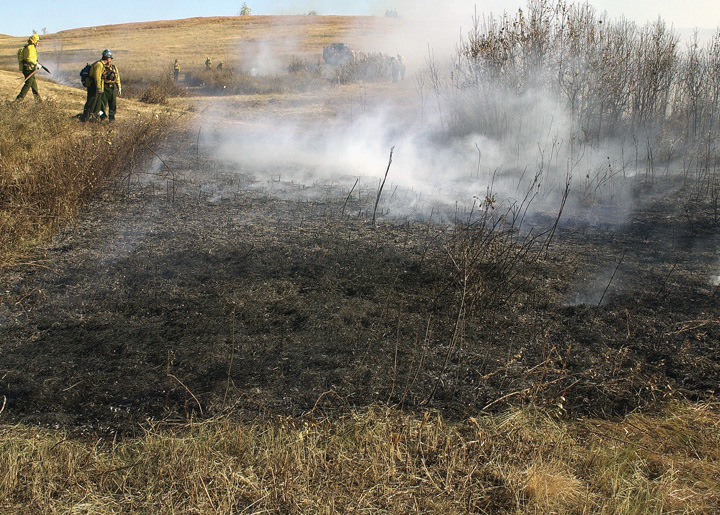 Controlled burns can be used as part of an integrated program to control invasive weeds, such as Canada thistle. Figure 7B. 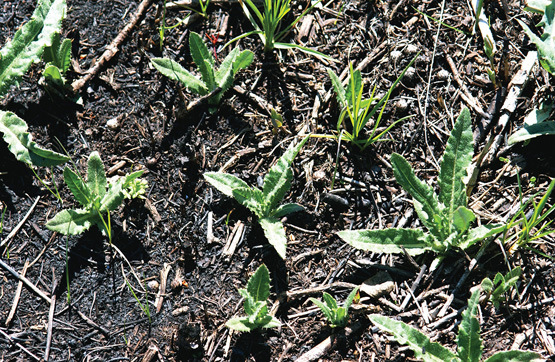 One of the first plants to emerge following a burn is Canada thistle. Herbicide coverage is maximized and nontarget injury is minimized with this integrated control approach. Long-term control of thistles with herbicides depends on timely application for maximum effectiveness and on re-treatments to reduce the seed bank of all thistles and root reserves of perennial thistles. The most current edition of publication W-253, “North Dakota Weed Control Guide,” provides specific herbicide rates and crop rotation for thistle control in North Dakota. Always consult the herbicide label for specific application rates, timing, and cropping sequence. Biennials. Biennial thistles do not survive under crop rotation since they cannot tolerate tillage or crop competition. Planting infested areas to any crop will eliminate biennial thistles. However, this practice may not be suitable for rolling, sloping and erodible fields. Perennials. Canada thistle is the only thistle in North Dakota that has become a cropland pest. The best approach to Canada thistle control in cropland should include an in-crop herbicide treatment to suppress Canada thistle growth, minimize crop yield losses and prepare the thistle for a fall postharvest treatment. Preharvest and fall-applied treatments provide the most effective long-term control. The best herbicide to use will vary depending on crop rotation. However, the control program must be uninterrupted for two to three years to reduce the infestation. Apply herbicides at the correct crop stage and at labeled rates for each crop. Application beyond designated timing or using higher than labeled rates may result in crop injury. Use caution at application to prevent drift to sensitive crops. An option for Canada thistle in row crops and fallow that includes both tillage and herbicides is known as the rosette technique. The objective is to prevent the plants from bolting by using tillage and/or herbicide treatments until the day length is less than 15 hours, the minimum day length required for most Canada thistle plants to bolt. The thistles then will regrow as rosettes only. Research at NDSU has found herbicide absorption and translocation to the roots of Canada thistle is greater when applied to the rosette growth stage than when applied to bolted plants, making fall treatment of rosettes the most cost-effective method for long-term Canada thistle control. 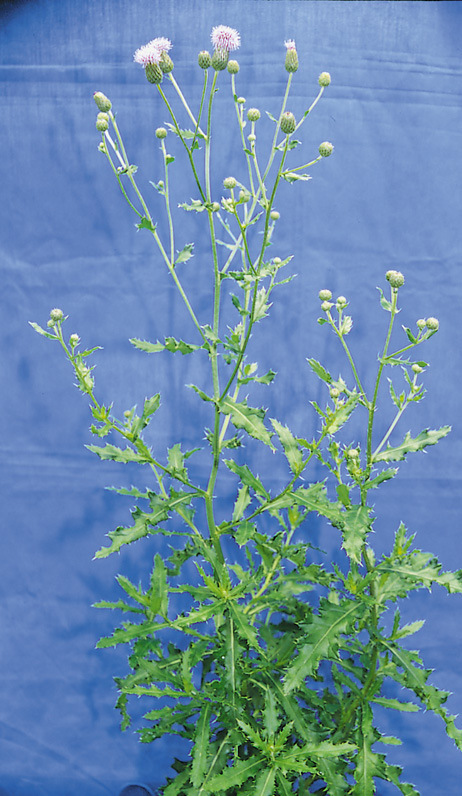 The rosette technique for Canada thistle control in fallow includes the use of tillage and fall-applied herbicides, while control in row crops includes in-crop herbicide treatments, tillage and fall-applied herbicides. Periodic tillage in fallow is used to control Canada thistle shoots and other weeds until late July, when the day length is less than 15 hours. Herbicides used for Canada thistle control then are applied to rosettes in late September or early October. Herbicides and/or tillage can be used to control Canada thistle in row crops to prevent bolting. Cultivation should be continued until canopy closure in soybeans and until early July in corn. Research at NDSU has found that cultivation until late June prevented more than 90 percent of Canada thistle from bolting in corn and soybeans. A second option in soybeans is to apply a split application in lieu of tillage. Herbicides then are applied in the fall following harvest for Canada thistle control. The rosette technique controls Canada thistle in both fallow and row crops during the season, and maximizes the number of rosettes for better herbicide absorption and translocation in the fall. Biennials. Fall is the preferred time for applying herbicides for biennial thistle control. Fall treatment allows more time for herbicide application than in the spring, and thistle control generally is best with fall treatments. Seedlings that emerge in summer after tillage or previous herbicide applications will not bolt but remain in the rosette stage. Biennial thistles are most susceptible to herbicides in the rosette form. Herbicides should be applied as late as possible in the fall, but prior to a killing frost to allow for maximum seedling emergence and rosette size. Seedlings that emerge after spraying will remain vegetative until the following spring and can be treated then. Long-term eradication of biennial thistles is difficult because of the large number of seeds each plant can produce. Perennials. For perennial thistle control in noncropland, herbicides may be applied in the summer or fall, when thistle is at or beyond the bud stage of growth. Perennial thistle control usually is greater when treatment is applied in the fall rather than the spring. Consult NDSU Extension Service publication W-253 "North Dakota Weed Control Guide" for the latest recommendations for thistle control with herbicides. Grazing restrictions vary with herbicide and application rate, so read the label carefully before using. 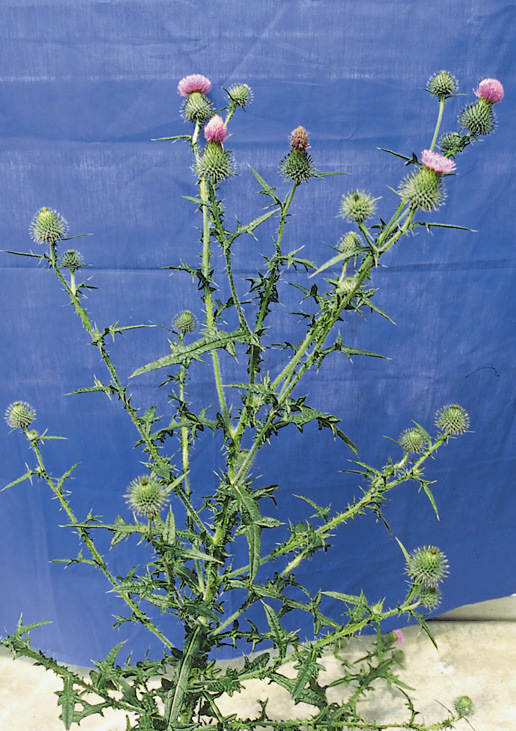 Insect biocontrol agents have been released on both musk thistle and Canada thistle with limited success. The seed weevil Rhinocyllus conicus was introduced from Eurasia to control musk thistle by reducing seed production. Larvae develop in the flower head and consume the seed as it develops. The weevils can reduce seed production by nearly 80 percent, but they are attracted more to early-blooming than late-blooming flowers. The late-season flowers produce seeds with little damage from the weevil, which sustains the musk thistle population. Five to 10 years are often needed for an insect to reach a population high enough to reduce seed production. R. conicus also will attack seed heads of Canada thistle and many other thistle species, both native and introduced. However, the resulting damage to various thistle populations has been minimal to date. Another weevil introduced for musk thistle control is Trichosirocalus horridus, which feeds on the apical meristem of the thistle rosette and developing stems. The feeding causes multiple stems to be formed, instead of a single stem, when the plant bolts. The multiple stems produce small flowers with few seeds, which is beneficial to the R. conicus population. However, even with the two biological agents working together, musk thistle is only partially controlled. A second control method, such as herbicide treatment, is needed to stop the spread of the weed. Two biological control agents have been introduced for Canada thistle control, and a third was introduced accidentally. To date, none have been effective at reducing the weed on a large scale. The Ceutorhynchus litura weevil first was released in North Dakota in the 1970s. The larvae feed on the underground parts of Canada thistle for a short time, but little, if any, noticeable effect on an infestation has been observed. The effects of the weevil must be supplemented by using additional control methods, such as mowing or applying herbicides. A gall-producing fly, Urophora cardui, causes meristematic galls, but does little long-term damage to the perennial thistle. The Canada thistle bud weevil Larinus planus was an accidental introduction into North America. The insect feeds on developing flowers to prevent seed production. Although L. planus can survive under a wide range of climates, it has not reduced established Canada thistle stands. The painted lady butterfly (Vanessa cardui) can be a very effective biological control agent, but only on an intermittent basis. Larvae of the butterfly feed on Canada thistle plants and can eliminate an infestation. However, the insect generally is found in only southern states, such as Arizona and New Mexico, and will build up populations large enough to migrate north only once every eight to 11 years. The insect will migrate north as far as Canada, and those fortunate enough to reside within the migratory pathway will see a dramatic decrease in the Canada thistle population. Unfortunately, the insect feeds on many plants, including crops such as soybeans and sunflowers, and is not a candidate for long-term biological control of Canada thistle. Photos by Rodney G. Lym.